Food safety is a key concern for international trade in fish products. The constantly changing regulatory environment and safety requirements of importing countries pose a special challenge to small-scale aquaculture producers. The programme assists members to assure the safety and quality of aquaculture products through the adoption of science-based better management practices. Policy issues concerning aquaculture certification and activities in market access are also addressed. The programme focuses on assisting small-scale farmers to adapt to the changing trade and safety environment. Cluster-based management approaches and formation of farmer societies are promoted as practical mechanisms for implementation of better management practices. Evaluation of commodity-specific better management practices for meeting domestic and international food safety standards. Facilitating establishment of national residue testing and monitoring programmes and sharing of information amongst member countries. Improving access to markets by small-scale farmers. Improving market development for low-cost aquaculture commodities. Address biosecurity and associated human health issues regarding the consumption of fish and processed products. Development of farmer groups and cluster-based certification concepts and methodologies. Video presentation on the rationale for increased fish production and consumption. The first ever Regional Training Course on Culture-based Fisheries in Inland Waters was held at Nha Trang University from 30 October to 8 November. The objective of the course was to provide participants with the skills to assist local communities to plan and manage culture-based fisheries. These practices are an example of a relatively simple and low cost technology that can deliver nutritional and economic benefits to rural communities, which often have few livelihood options. 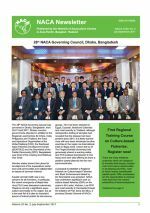 28th NACA Governing Council, Dhaka, Bangladesh; register for the First Regional Training Course on Culture-based Fisheries; 11th Indian Fisheries and Aquaculture Forum, Kochi, 21-24 November; audio recordings for regional feed consultation now available; tilapia lake virus; Proceedings of the International Symposium on Aquatic Animal Health and Epidemiology for Sustainable Asian Aquaculture; ICAR-CIBA launch "Vanami Shrimpapp", a mobile app on Pacific white shrimp (Penaeus vannamei) farming; Pakistan officials train on aquaculture certification. 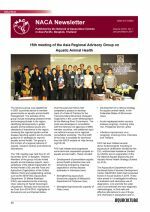 The 15th meeting of the Asia Regional Advisory Group on Aquatic Animal Health; a regional consultation on responsible production and use of feed in aquaculture; a report on the Giant Prawn 2017 conference; a preview of the new NACA website; and new initiatives on a very serious emerging issue - reducing the human and animal health risks from development of anti-microbial resistance in the aquaculture industry. The regular shell colour of farmed Litopenaeus vannamei is off-white to greenish-white but instances of L. vannamei with brown-shell colour do occur in farmed shrimp. A study was conducted to determine if there were differences vis-à-vis shell colour, meat colour, meat composition and meat texture. White-shelled vannamei was determined to be better in terms of meat composition and texture profile but brown-shelled vannamei yielded a more brightly red-coloured cooked product. Due to the recent increase in aquaculture and the rising demand for marine ingredients for use in pelleted feeds, there is concern that aquaculture is contributing to the over-exploitation of fishing stocks. There is a growing need for aquaculture enterprises to be able to demonstrate responsible practices, including the source of any marine ingredients used in the compound feed. Responsible sourcing can be demonstrated by purchashing ingredients that have been approved under the IFFO RS standard. Concerns about the health and safety of consumers are the driving force for the enforcement of traceability systems for aquaculture products. 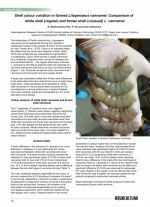 DOF's strategy to improve food safety related to shrimp production is a “Farm-to-Table” approach. This has been implemented through the development of a Code of Conduct for the marine shrimp industry, establishment of Good Aquaculture Practices for hygienic shrimp production, and documentation requirements for movement of chemical agents and purchase of aquatic animals. 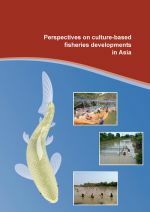 This book is the proceedings of the “Regional Consultation on Culture-Based Fisheries Development in Asia”, held in Siem Reap, Cambodia, 21-23rd of October 2014, under the auspices of the Australian Centre for International Agricultural Research (ACIAR), the Mekong River Commission (MRC) and the Network of Aquaculture Centres in Asia-Pacific (NACA). The consultation was jointly organised by NACA and the Fisheries Administration of the Royal Government of Cambodia.